2017 Advocacy - Family Child Care, Inc. 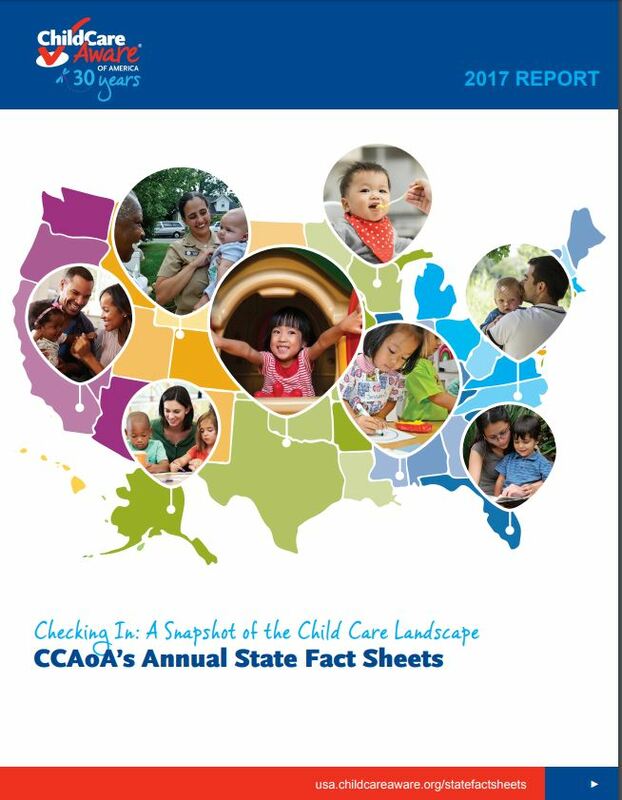 The 2017 Legislature made changes to background study requirements for child care to comply with the federal Child Care Development Block Grant. You will find updated frequently asked questions about child care background studies on the DHS website. Location: Room 3148, DHS-Lafayette Building (444 Lafayette Road, St. Paul, MN 55155). Parking: Information on parking at 444 Lafayette is available online. 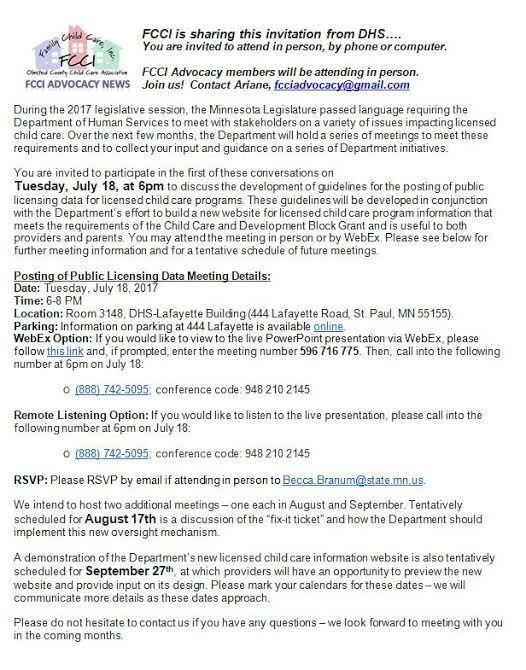 RSVP: Please RSVP by email if attending in person to Becca.Branum@state.mn.us. FCCI’s is championing our “Fix-it Ticket and Exit Interview” Bill. It has been included in the Health and Human Service Omnibus Bill. This is good news and your final opportunity to advocate for its passage into law! FCCI encourages you to be a part of the final 2 weeks of the legislative process. Session ends at midnight on May 22, 2017. 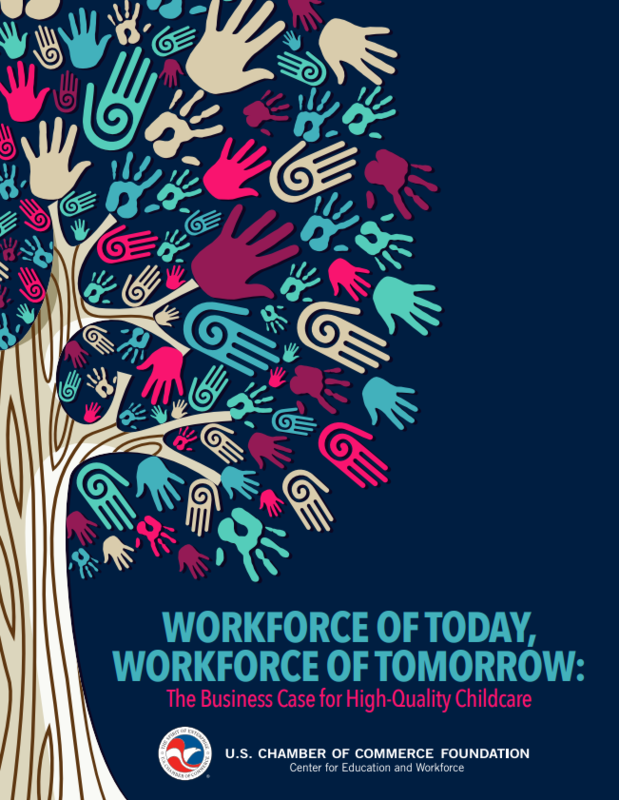 FCCI along with other early education organizations do not support the proposed Universal Pre-K plan. The majority of early education organization and leaders support investing in targeted funding for children at most risk. FCCI encourages sending your own personal letter or using talking points from the sample letter below. 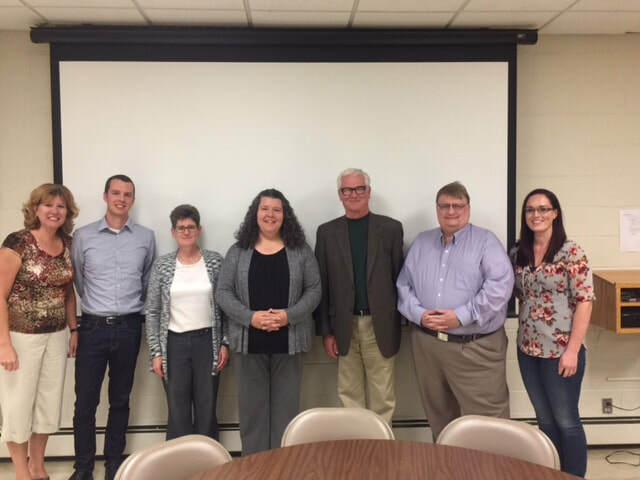 Several bills have been introduced to provide consistency and support to family child care programs this legislative session. HF 1298 – Will change the negative action appeal process, so that the Administrative Judge’s ruling would be final. Currently if a family childcare provider has a negative action against them and chooses to appeal the Administrative Judges ruling is only a recommendation back to DHS. 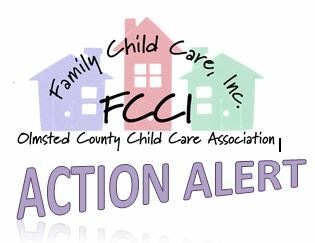 HF 1299 – Will require that county agencies and childcare providers be informed of licensing changes in a timely manner for counties to apply changes and promote compliance of new changes with childcare providers. The licensing changes must also be posted publicly online. HF 1300 – Will define the Child Care licensing definition of "annual" modified for the purpose of clarifying "annual training" requirements. "Annual" or "annually" means during a licensing term that begins with the effective date of the license and ends the day before the date the annual license expires; not based on when the training was taken. HF 1301 – Will Remove posted correction order if reversed from posting at provider's home and from DHS website. If the commissioner reverses or rescinds a violation in a correction order upon reconsideration, the commissioner shall issue an amended correction order and the license holder shall post the amended order. If the correction order is rescinded or reversed in full upon reconsideration, the license holder shall remove the original posted correction order. HF1306 - Will add that a family child care provider who is also a foster care parent is eligible to receive child care assistance subsidies for a foster child during the hours the provider is providing child care or being paid to provide child care to the foster child. HF 1311 – Will Requires county licensors to offer providers an exit interview upon completing the licensing inspection before leaving the providers home. Providers will be made aware of correction orders or potential correction orders at this time and offered technical assistance on how to come into compliance. The family child care provider can choose to opt out of the exit interview. Will also authorize a “fix-it ticket” alternative to a correction order in certain circumstances. The “fix-it” ticket addresses minor issues that can be easily fixed. The violation must not endanger the health, safety, or rights of persons in the program and must be able to be corrected immediately or within 2 business days. HF1329 - Will prohibit child care correction order quotas that might be placed upon licensing agencies.